The combination of these features makes the games fun to play over and over again. You have to play a lot to get good, but since the game is procedurally generated, you’re always facing new situations. You have to use your wits to survive. 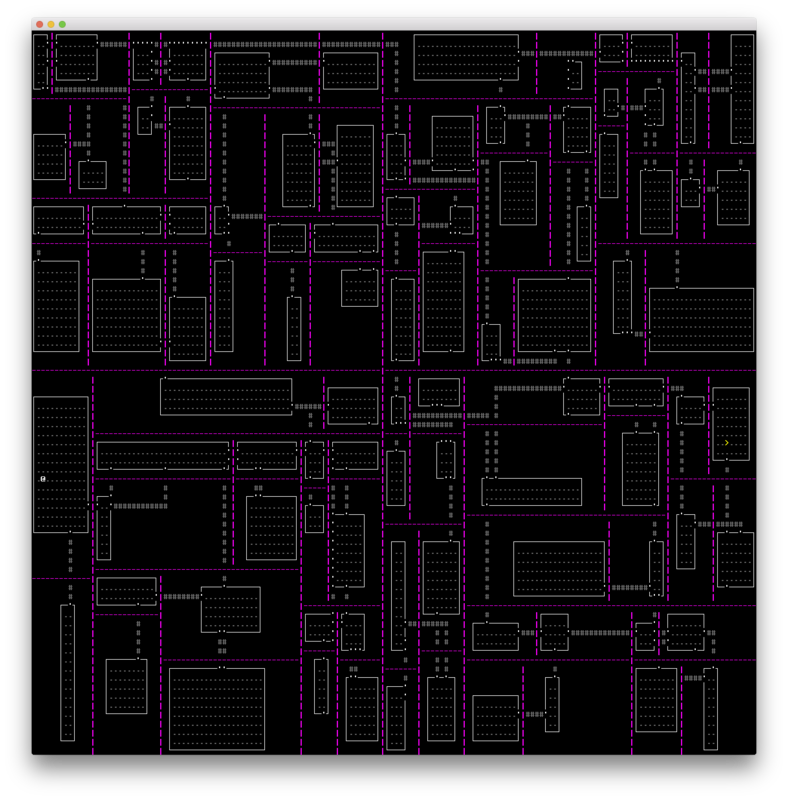 I started on Friday night with a level generator. 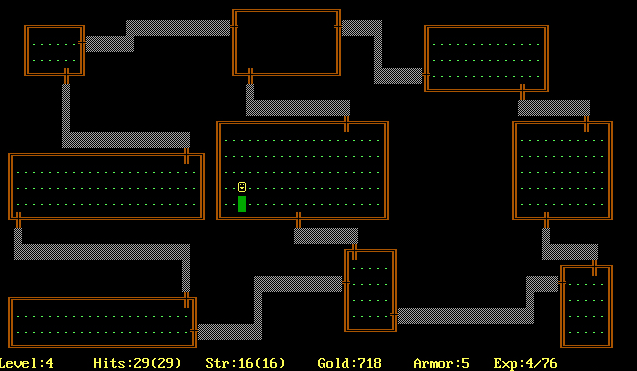 When you’re time-constrained, you have to make very careful decisions about where to innovate, and I chose to stick to a roguelike trope for my basic layout: boxy rooms connected by narrow corridors, with doors where corridors meet rooms. I could have placed a bunch of rooms randomly and made sure each one was connected to another, but it’s tricky to use space efficiently that way. A common way to avoid this problem is to use a binary space partitioning tree. But it’s more interesting to mix it up with different sizes of rectangles. You probably noticed I annotated all the cells with aab and such. We’ll use that information to add corridors. For every pair of areas that share the first 2 letters of their identifier (“siblings in the tree”), we add an L-shaped corridor from a random point in one to a random point in the other. If a point is already inside a room, we’ll leave it alone. If a point is on a wall, we’ll turn it into a door. All rooms are reachable from all other rooms. For a given pair of room groups (everything under a vs everything under b, for example), there is exactly one path between them. That last point has some good and bad ramifications. On the bad side, it worsens replayability, because the corridors are roughly organized the same way from game to game. I noticed this while playtesting; after 3 games it’s obvious that the rooms generally have the same layout. But those characteristics allowed me to take a simple approach to matching the theme of Ludum Dare 38: “A Small World.” The first two splits don’t have to be random; if they always split the sections evenly, then the map will have 4 even quadrants. 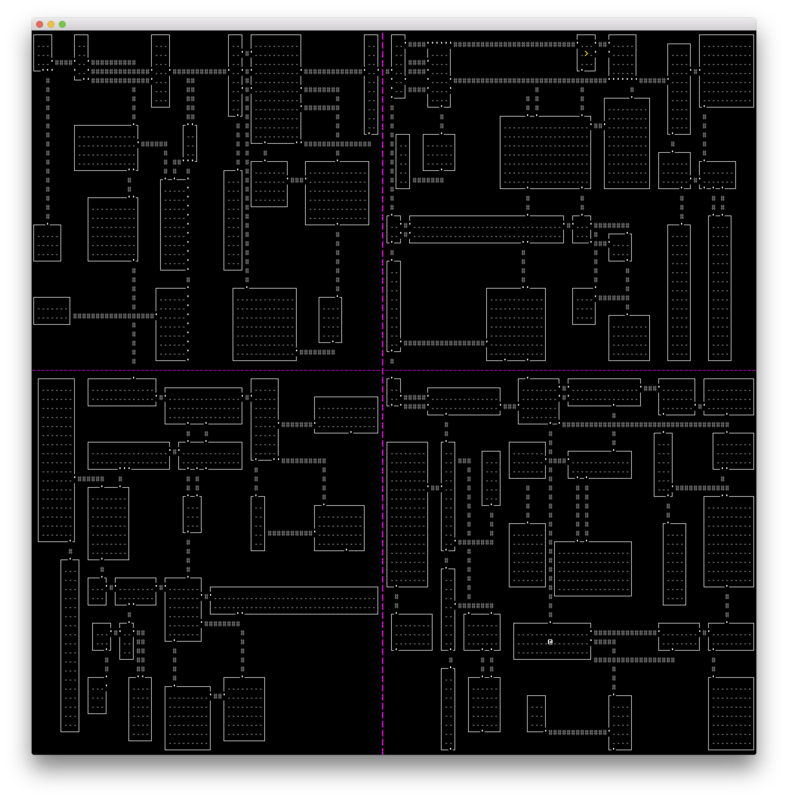 I used this to create 4 distinct areas of increasing difficulty, so I could have a “one-level roguelike” with some actual progression. The player starts in aa and moves to ab, then bb, then ba, where the goal is. Originally the colors were just for debugging, but I ended up leaving them in place because they signal specialness. So within each quadrant, there is an 80% chance a room will have shape box_random, a quadrant-specific color, 5 monsters per 100 tiles, 5 items per 100 tiles, and allow any area-appropriate monster. But there is a 20% chance that the room will have the shape box_full (fill its entire BSP tree cell) and contain only verps, 2 per 100 tiles. All of those things affect the player’s behavior, strategy, and tactics. 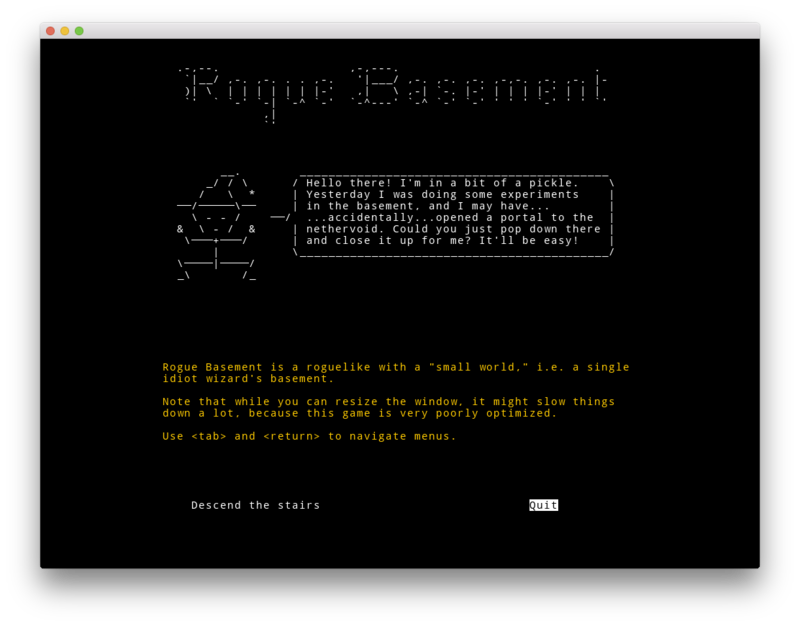 For a time-constrained game like Rogue Basement, I wanted to stick to the absolute basics. After adding the verps, I wanted to balance them out with a monster that attacks from a distance. I started by defining a behavior range_5_visible which acts like beeline_visible, but instead of trying to move onto the player’s space, the monster tries to be exactly 5 tiles away. If the player approaches the monster, it will run away unless it is backed into a corner. I attached this behavior to a new enemy type, the wibble (w). But a monster that only runs away isn’t very challenging! So it was time to deepen the simulation by adding items. Monsters (including the player) can hold them in an unlimited inventory. When a monster dies, its items are dropped on the ground. Since its “difficulty” is -1, it never spawns in the initial level. Its only behavior is to move along a path until it hits a wall, a monster, or the player. It has 2 hit points. This is a special item, so the game ignores the strength and items attributes in the CSV file. Instead, the rock_in_flight‘s strength value is taken from the monster that threw the rock, and the original rock item is added to the rock_in_flight‘s inventory! When the rock_in_flight‘s path_until_hit behavior detects that its life is over, the rock_in_flight “dies” and the contents of its inventory (the rock) are dropped on the ground. I added a “sleep” behavior to differentiate wibbles from verps. When the player isn’t around, verps are hyperactive and run around randomly; wibbles sit and meditate. It seemed in keeping with their fighting styles. That all worked great, but when wibbles ran out of rocks, the game got really easy! So I added another behavior, pick_up_rocks, which makes a wibble either move toward any adjacent rocks, or pick them up if it’s standing on one. The “conservation of rocks” principle introduces a new tactic into the game: players can pick up all the rocks to deprive the wibbles of their ammunition. Fortunately the player’s backpack is infinitely large! At this point, combat consisted of punching verps and dodging or punching rocks. (Yeah, you can punch rocks! They are just monsters after all!) I wanted to make it possible to avoid almost all damage, though, by understanding the game’s systems, and the verps made it too hard to do that by being relentless. For experienced roguelike players this makes the game easy once you figure it out, but I believe it’s still a rewarding experience to figure it out in the first place. It is very, very difficult to make a game by yourself in 48 hours that has more than a few minutes of worthwhile gameplay, so I was aiming to just make those few minutes as good as possible and then let players feel like they could put it down after a good experience. To make each section its own challenge, I decided to have the colored hallways between sections heal the player completely. This is another difficulty decrease that I could probably have left out, but I decided to err on the side of easy because I knew I had some user interface issues and wanted to be “extra” fair to players. The simulation has a few features I didn’t intend, but that I don’t regret—that’s half the fun! You can punch rocks out of the air. If you throw a rock, and then walk in its direction, you will punch it dead before it has a chance to move. If two wibbles throw rocks at you at the same time, they may collide in midair and die. I took 90 minutes to write 4 tracks, adding up to 11 minutes of music. Each map quadrant plays one of the tracks. You can listen to them here. The music fades down when you’re in a colored hallway and fades up again when you enter a room in a map quadrant. My intention is to build tension and give the player a clue, in addition to the different colors, that the monsters are about to get tougher. There were 1,104 “compo” (48-hour, one person) games, of which 549 had enough ratings to get scored and ranked. Here are the scores for Rogue Basement. Percentiles are within the 549 ranked games. It looks like the soundtrack was my secret weapon. Audio got a great score, and I’m guessing that gave me a boost in Mood and Overall. The Theme score is very low, which I’m a little surprised at but also don’t care about. Innovation was one of my dump stats this round, so its low score makes sense too. 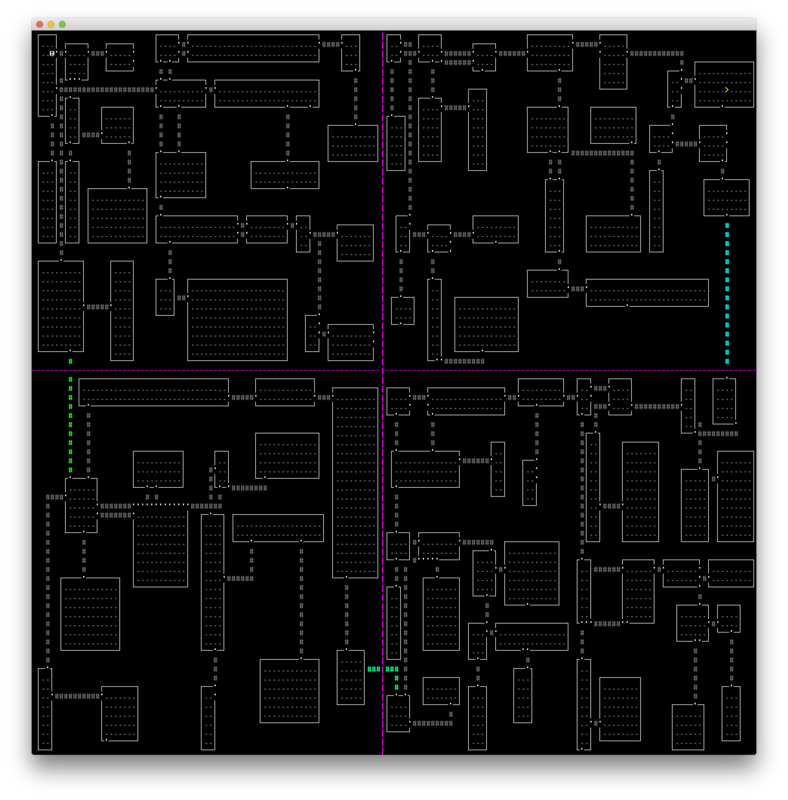 I did make a very by-the-book roguelike. Graphics was my other dump stat in that I used ASCII, but I’m a little hurt that people didn’t appreciate the aesthetic more. From past experience, I knew that scope was always a problem, so I tackled the highest-priority mechanics first, which means I ended up with a real game instead of a tech demo. It’s very difficult to tune for difficulty without time to playtest and fix things! I kept making the game easier because developers almost always make games too hard on the first pass, and I wanted to overcompensate to make it more likely that people would finish it in one sitting. The feedback so far seems to indicate that the difficulty is just about right. No one says it’s too hard, and some people say they’ve been playing for 25 minutes(!!!) and haven’t beaten it yet. Every time I moved some data out of Python code into a CSV file, it got 10x easier to add new content, but not for the reason you might thing. Yes, copy/pasting CSV rows is an easy way to add new things, but the act of designing the file format made me think about how the whole program worked and put flexible systems in place that would let me do more cool stuff later. I can already see the limitations of CSV, so I think next I’m going to switch to CSV, but with YAML values for each column. I really like the efficiency of editing CSV, but it’s not flexible enough to do what I want. 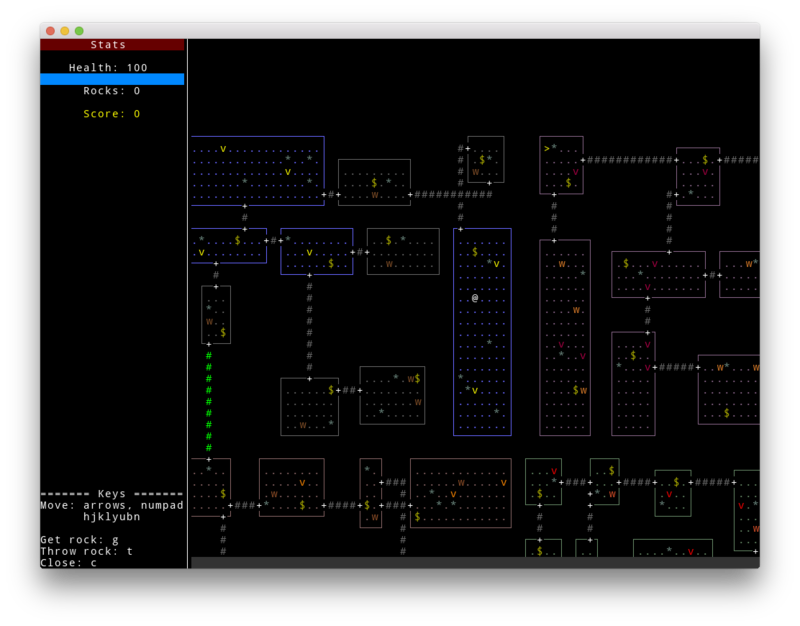 The week before Ludum Dare 38, I worked on an ASCII user interface and roguelike development framework. I didn’t want to spend a bunch of time making a crappy title screen, I wanted to focus on gameplay! By writing and releasing the framework, I had all the relevant APIs in memory as soon as the competition started, and I could get going immediately on the important stuff. The music is really simple, but it adds a huge amount of atmosphere and is a strong signal of progression. It was time well spent, especially since when I made it (the middle of the night) my programmer brain wasn’t working anymore. Most of the positive reviews mention the music. 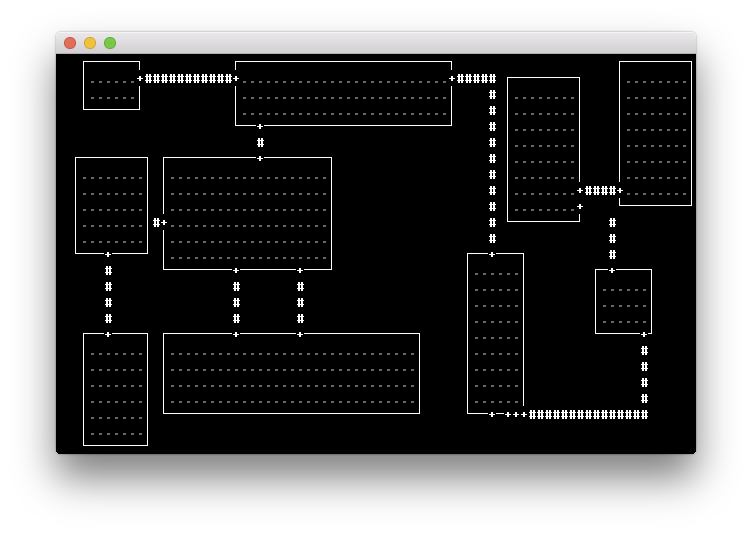 Since ASCII is traditional for roguelikes, I thought I wouldn’t lose too many points in graphics. In my opinion, good ASCII is better than bad pixel art. But I was wrong, and I was ranked in the bottom 35% of scored games. 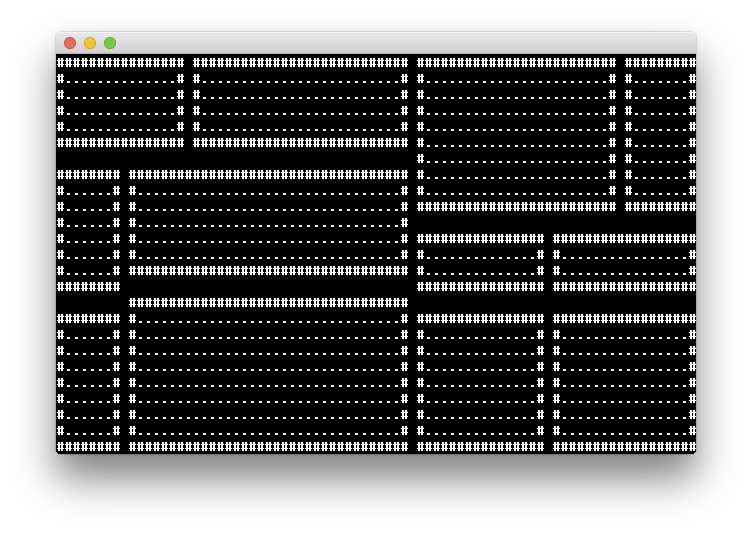 Even though I lost points on graphics, I’m glad I went with ASCII, because it gave me a lot more time to focus on mechanics and the design of my engine. I would consider using ASCII again next time, graphics score be damned. Whenever I felt like I hit a milestone, I did a quick video update. I didn’t really expect anyone to watch them, but it helped give me perspective on my progress. And it simulated human interaction a little bit, which was nice because I was alone in the house for the entire weekend. I wrote the game in Python 3. For graphics, I used BearLibTerminal. I played the music with pyglet. And for assorted algorithms, state management, and user interface features, I used my own clubsandwich library. To package the game for OS X and Windows, I used PyInstaller. This combination works really well. The main downside is that calling C libraries from Python is slow, and I had to do some optimiziation work to get a decent frame rate. In the future, I might switch the graphics over to use pyglet entirely, but I really like using BearLibTerminal because of its limitations. You get a grid of tiles and nothing else. It’s liberating. This is probably the most fun game I have ever made, and ties for most fun making a game alongside my last Ludum Dare success.